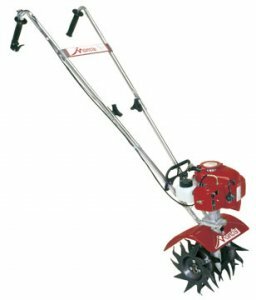 Mantis 2-Cycle Tiller All season tiller with patented serpentine tines that till down to 10", chop through tough sod or hard clay soil. Tines spin at up to 240 RPM and are mounted under the engine so you can guide the unit between narrow rows and tight spaces. Powerful commercial grade 2-cycle engine and durable 1-piece gear box. Push-button priming for quick starts. Speed control and shut-off switch. Lightweight, fold-down handle bars are well braced and perfectly balanced for long reach into garden beds or carrying to the shed.